The Creations Elite is the newest member of the Creations Series from Vitamix. 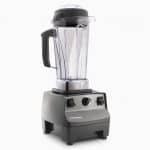 This model finally brings the updated base design found in the Vitamix 7500 and Professional Series 750 models to the Creations Series lineup. 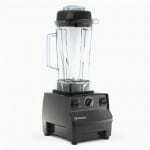 It is a member of the G-Series (NextGen) line-up of blenders. The redesigned base and more powerful motor are paired up with the compact 48 oz container to make this a completely unique package that you’ve likely seen featured on QVC as their TSV in the past. The unique combination of this Creations Elite package means that this one measures up a bit differently than most Vitamix models. The newly redesigned base measures 7.7″ wide, by 9.4″ deep, and 17.5″ high with the 48 oz container stored on top. It weighs in at a hefty, 11.7 lbs and comes with the same, standard 6 foot cord, which can be coiled up and stored neatly beneath the blender base. Surprisingly, the Creations Elite is only offered in one color, black, if purchased direct from Vitamix, but is available in five additional colors (red, white, cinnamon, blue, and espresso) if purchased through QVC. You can get free shipping – a savings of $25 – on your Creations Elite purchase when you buy direct from Vitamix using this link. As part of the Creations Elite package, you’ll receive the Creations cookbook, a Let’s Get Started DVD, a mini tamper to fit the smaller 48 oz container, and as an additional bonus, an insulated stainless steel smoothie cup. One thing that stands out about the Creations Elite is that it comes with the smaller 48 oz capacity container. 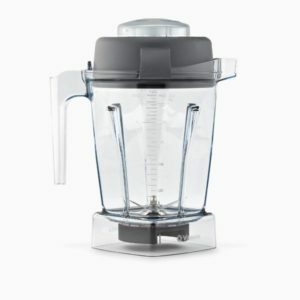 It is currently the only model sold by Vitamix that pairs the old container design with the newly redesigned base and it looks a bit awkward. The shorter profile of the 48 oz container means that you should have no problem storing the unit as one piece under your standard kitchen cabinet. This is one of the biggest complaints we see with the Vitamix, it is extremely tall when paired with the older model, 64 oz containers. As with the rest of the containers offered by Vitamix, this one is made of shatterproof, BPA-free plastic, and is extremely easy to clean. Just fill the container halfway with warm water, add a few drops of dish soap, let it run on high for about a minute, then rinse, and let dry. The Creations Elite is the first model sold through QVC to come with the 2.2-peak horsepower motor. This is the same rating as the motor found in the Vitamix 7500 and is capable of reaching 270 miles per hour, or 28,000 revolutions per minute, at full power. Also, since this model uses the newly redesigned base, it is also significantly quieter than the earlier models. There’s no doubt that this model is still noisy, but the difference is a welcomed change. Unsurprisingly, the controls on the Creations Elite are identical to those found on the 7500. It comes equipped with an few small updates from the previous models, but uses the same familiar switch and dial configuration. You’ll find a power on/off toggle, a variable speed dial, with speeds from 1-10, and a pulse toggle. This pulse toggle gives you the ability to quickly turn the blender on and off making chopping easier by allowing you to work in short bursts. This is a tough one, but we’d recommend taking a look at the Vitamix 7500 and comparing these two models. For nearly the same price, you could purchase a new brand 7500 and the smoothie cup, and get the redesigned 64 oz container with an additional 2 years of warranty coverage. In my honest opinion, I don’t see the appeal of the older, smaller 48 oz container in this case and would recommend looking into other the options instead. Even if you are comparing this package at the QVC special offer price, which is significantly cheaper than the price advertised on the Vitamix website, you should consider purchasing a Certified Reconditioned Next Generation model for $439, which is basically brand new and comes with a 5 year warranty. This doesn’t happen with the lower settings – is this normal? I also have the commercial 4000 max that I purchased new when they came out and I still have it and using it on occasion. I purchased the Elite as it has a larger powerful motor. The noise from the Elite at the higher setting – is this a normal sound? The sound you’re describing does sound a bit off. I would recommend calling Vitamix’s customer service line and describing the noise to them and if necessary, start the repair process. 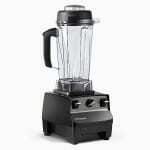 I am comparing the Vitamix Creations Elite and the Vitamix 7500 models on QVC. I am wonering if the 7500 model makes soups as advertised for the Creations Elite? After stomach surgery, I consume soups every day, and I need this feature. Can I make hot soups in the 7500 model? Also, can the under-the-counter 64-oz container be purchased separately? Yes, all of the Vitamix models are capable of making soup since they have a very similar level of performance. The friction created by running the blender on the high speed setting for an extended period of time (normally 4-6 minutes) will heat up the ingredients. 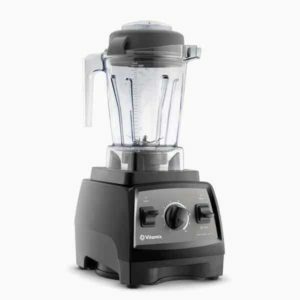 Currently, the shorter, 64 ounce container can not be purchased separately through the website, but if you call Vitamix directly, they may be able to make an exception. The Creations Elite has a 2.2-peak horsepower motor (1440 watts), while the new Ninja has a 2.5-peak horsepower motor (1500 watts). If you compare it on this fact alone, the Ninja does have a slightly more powerful motor. However, to compare it only on this number alone is unfair as it doesn’t tell the whole story. In my opinion, having a 5 or 7 year warranty of a slightly less powerful motor means much more. I’m trying to decide between the Creations GC, Elite or the 7500. I need it to fit under the counter for sure. I will be making the occasional container full of Margaritas or for soup, but otherwise, daily veggie/fruit smoothies for myself. Is the 7500 going to be too big for those daily uses? Thanking you in advance for your input. The 7500 sounds like a perfect fit! The wider 64 oz container that is paired with the 7500 still does very well with single servings. The Creations GC model comes with the larger 64 oz container, so it likely won’t fit under the your cabinets if they’re a standard height. The Creations Elite does have a shorter container, but it only has capacity for 48 oz, so if you’re going to occasionally make large recipes, you’ll probably need to end up making two batches. I bought a Vitamix Creations Elite several months ago. The top to the blender is missing. How much is a replacement? Thanks- look forward to hearing from you SOON! Can’t wait to use my blender again! 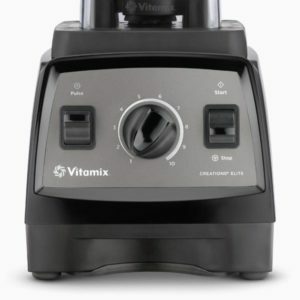 Hi Elizabeth, you can purchase a replacement container from Vitamix for $139 – http://www.blenderreviews.us/buy/vitamix/48-oz-container/ – Hope that helps! I was just reading Elizabeth’s question. She lost just the lid on a few months old Vitamix and she has to purchase an entire replacement container for $139? I would say that is quite the rip off! Saw the cost and thought unbelievable. Trying to decide about buying one…this makes me think twice. That was a response from back in 2013. I just checked with Vitamix Support today, and you don’t have to buy a whole new container to get another lid. You can call customer service (800-848-2649), and they may replace it as a courtesy. Otherwise, the lids are $15.95 US or $20.95 CAN plus shipping and tax. It’s best if you’re near your Vitamix so they can check the serial number. And also to verify the size of container the lid is needed for. I’ve found Vitamix Customer Service to be extremely helpful and quick. Hope this helps alleviate any concerns you had.